Euramax has won the Business Software Award 2016. The coating specialist received the prestigious award during the first day of the Business Software Event, 29 en 30 november 2016 in ’s-Hertogenbosch for their ‘smart productgenerator’, a dynamic integrated system in which Sofon and SAS are zijn linked to OpenIMS ECM, including the CRM-solution Sugar. Euramax was one of three nominees and René Driessen en Peter Wijers presented their project with succes. The solution is futureproof which was decisive to the jury, as was the flexibility in usage and further development for implementation. 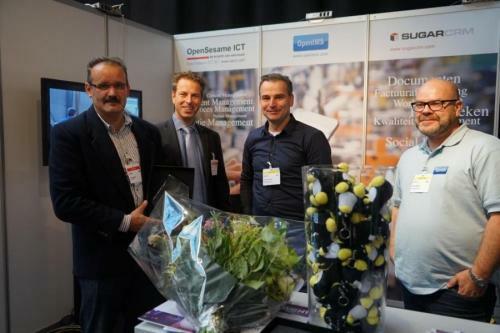 In the picture mr. Wijers (left) and mr. Driessen visit our stand to show their gratitude to Eric van Korven and Erwin Bartels for the central role of OpenIMS Document Management Server and the seemless integration with the CRM of Sugar. The interface with Sofon and SAS to exchange managementinformation fullfills the business support of Euramax. Euramax is a premium coil coating specialist with over 40 years of experience as a supplier of coil coatedmetals. 275 employees in Roermond (NL) en Corby (UK) take care of producing 15.000 kilometers painted metal per year. The pre-coated metals, in innovative color and design finishes, are used all over the world in a wide range of products: interior architecture, building roofs and facade cladding, recreational vehicles and more.